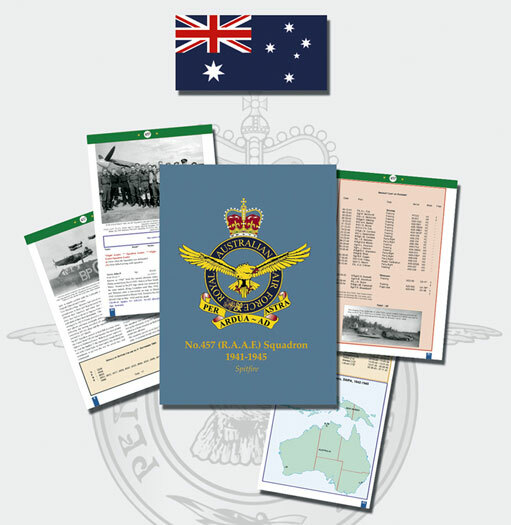 This is an excellent publication detailing the history of RAF No 457 Royal Australian Air Force Squadron during the era of 1941-1945. Shortly after Britain’s declaration of war, it was recognised that there would be a shortage of pilots and the British Government asked Commonwealth countries to supply partially trained aircrew for expansion of the RAF. The Empire Air Training Scheme was set up to train aircrew to a uniform standard across Commonwealth countries. Desirous of still exercising some control over their nationals, Article XV was set up whereby aircrew would be gathered into national squadrons and RAF No 457 Squadron was designated as a Royal Australian Air Force Squadron. The book details the history of the Squadron while it was operating Spitfires and details the operations, aircraft and the pilots who flew them. The book contains 90 pages containing many in-service black and white photographs. There are some nice colour artwork plates produced by Malcolm Laird of Ventura Publications fame. The book is nicely printed by Graphic Sud in France and comes in soft cover format. This publication is a concise history of No 457 (R.A.A.F.) Squadron 1941-1945 and is highly recommended.